2018 was the year when crypto didn’t get much love. Not just Bitcoin but several other cryptocurrencies have seen an acute downfall in their values in this year. Some currencies fell as low as 90%, and the crypto experts are now looking forward to 2019 to see how accurate their predictions will be. 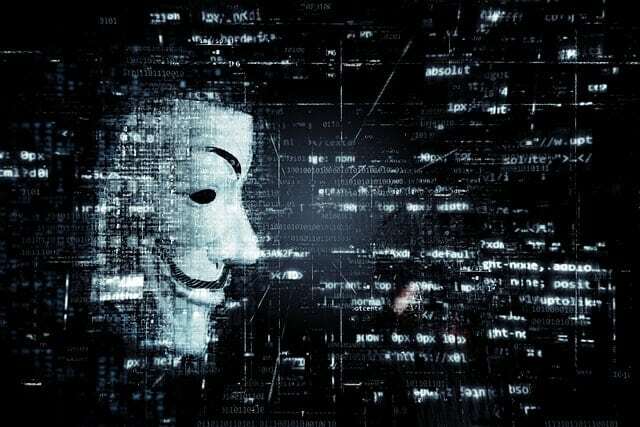 The year was also full of news related to exchange hacks, currency regulations, development of lightning network, and delayed exchange-traded funds. As you make trading and investing plans for the coming year, it’s important to look back at the year that was. Let us see the events that made highlights in 2018. 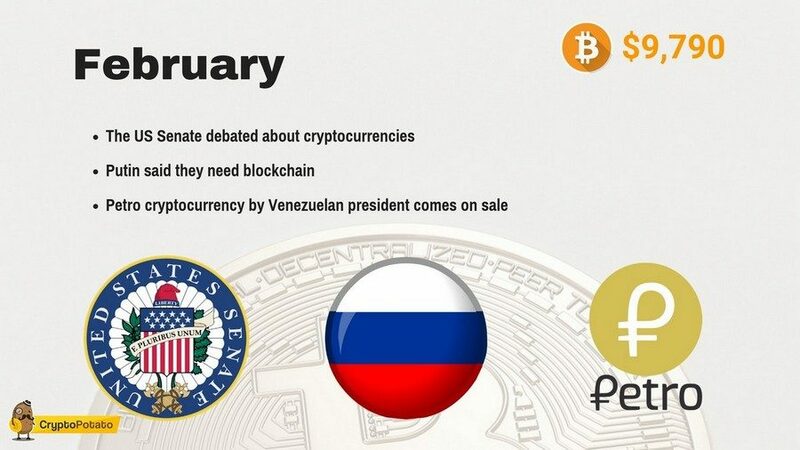 January began with much volatility and was probably the most unstable in the history of the crypto market. In just a few weeks after when Bitcoin stood high at $20,000, it collapsed by 50% in January. And while Bitcoin is declining steadily, it went down a steep slope on Jan 15, 2018, with other currencies such as Litecoin, Ripple, and Bitcoin Cash following its lead. And there were hundreds of other altcoins that lost their upward momentum and saw a quick downfall. Crypto exchange hacking news added to the misery. 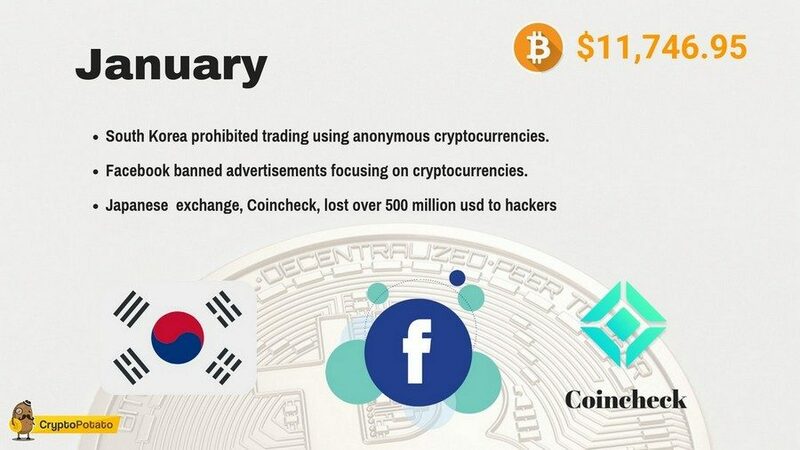 South Korea prohibited trading using anonymous cryptocurrencies. 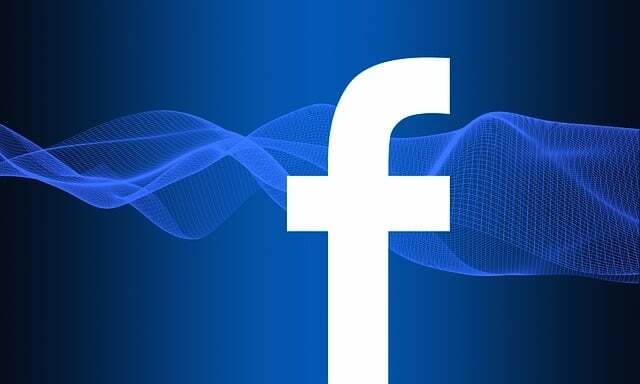 Facebook banned advertisements focusing on cryptocurrencies. Bitcoin was at 11,746.9 by the end of January. The western world has the opinion that cryptocurrency regulation is a significant need of the modern times. February heard a lot of calls between the German and the French finance ministers along with their US counterparts to discuss the issue of regulation during the G20 summit that was due in March. The IMF managing director supported this view. Bitcoin was at $9790 by the end of February. The crypto city faced another bad month in March. There’s a lot that happened, mainly in Poland. The National Revenue Administration circulated some letters to Polish exchanges, requesting transaction records and customer databases. 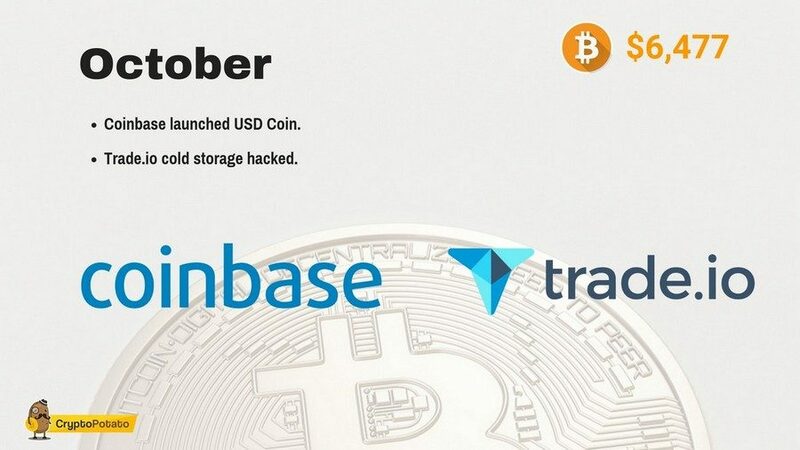 While this created a stir in the Polish userbase, the other parts of the world didn’t face a good time with crypto either. Prices of all cryptocurrencies were mostly falling, and investors and miners were generally unhappy about the scenario. G20 was positive on cryptocurrencies. 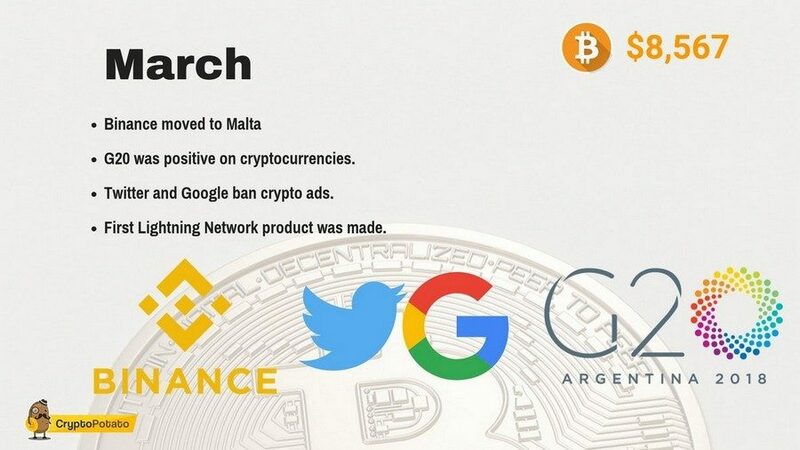 Twitter and Google ban crypto ads. First Lightning Network product was made. Bitcoin was at $8567.85 by the end of March. April proved to be a turning point, filling us with hopes as the crypto market rose from $250b to $430b. Most cryptocurrencies rose in value, and some of them even rose by over 100%. The market showed significant signs of improvement. Bitcoin was at $9404.55 by the end of April. The April rush could not sustain the month of May. All the top 10 cryptocurrencies fell in their prices. 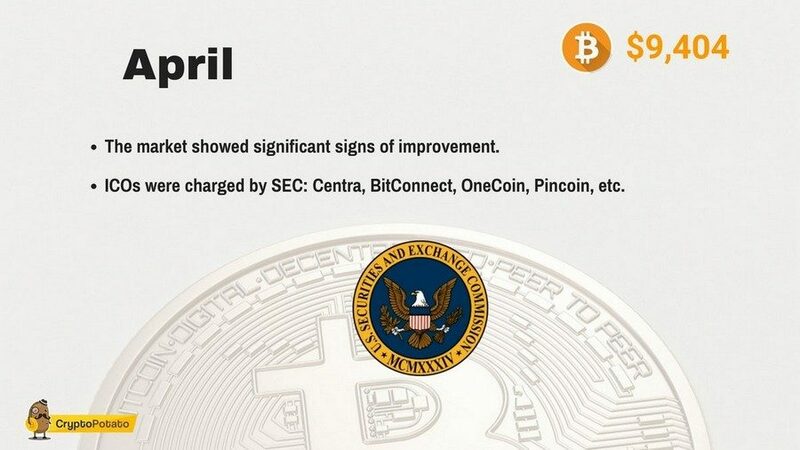 Some cryptocurrencies that showed a sharp increase in April fell severely in May. While Bitcoin entered May at $9,000, it was left at $7,500 towards the end of May. However, this downfall was expected as when the prices of crypto rise sharply, it is predicted that there will be some downfall. So May behavior was organic and was pretty much expected by the experts. Ukraine held a major blockchain event. NAGA and Ontology partner up in the crypto market. Bitcoin was at $7328.91 by the end of May. June saw some more hacking incidents. 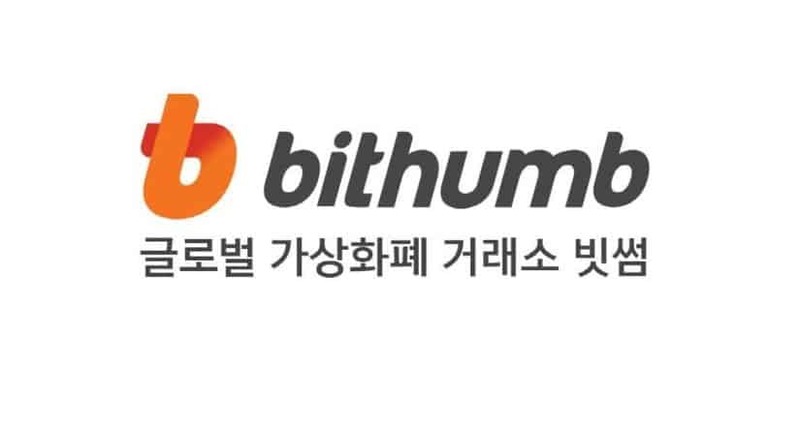 Bithumb, a South Korean exchange said it was hacked with coins worth over $30 million being stolen. It’s one of the busiest exchanges, and it was bad news for several traders. Also, we saw Facebook easing its crypto ad ban. And then there was the creation of Akoin by rapper Akon in his Akon Crypto City. On the other side, there were still some important organizations that didn’t favor crypto. For example, the Bank of England warned about crypto risks and how it can be harmful to banks. 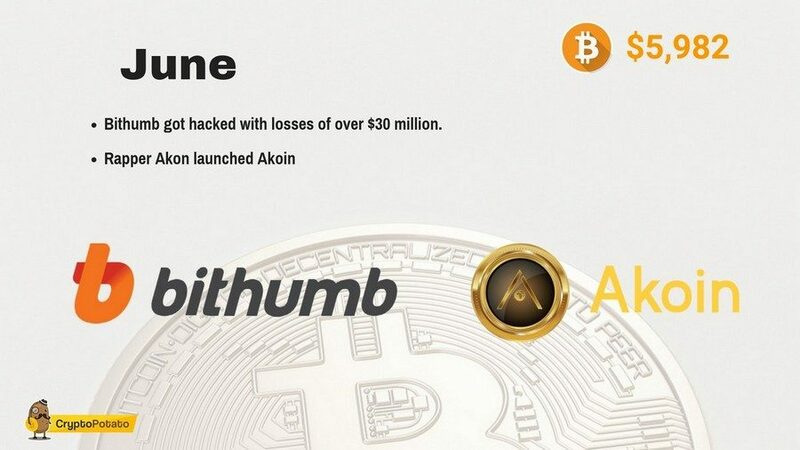 Bithumb got hacked with losses of over $30 million. Bitcoin was at $5982.37 by the end of June. While Bitcoin rose in value in July, several others toppled over. Some others such as Stellar and Bitcoin Gold gained momentum, but most of them didn’t show a positive surge. Again, there were news reports of hacking attacks. This time it was on Bancor exchange with a loss of about $23.5 million. 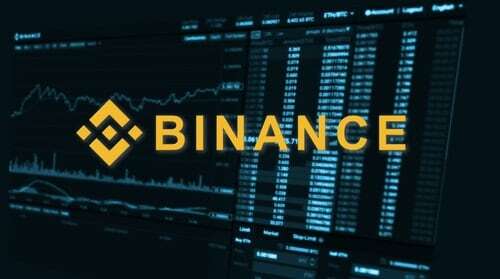 Binance also suspended their exchange services when they noticed suspicious Syscoin transactions. There were some new project announcements including one by VeChain. 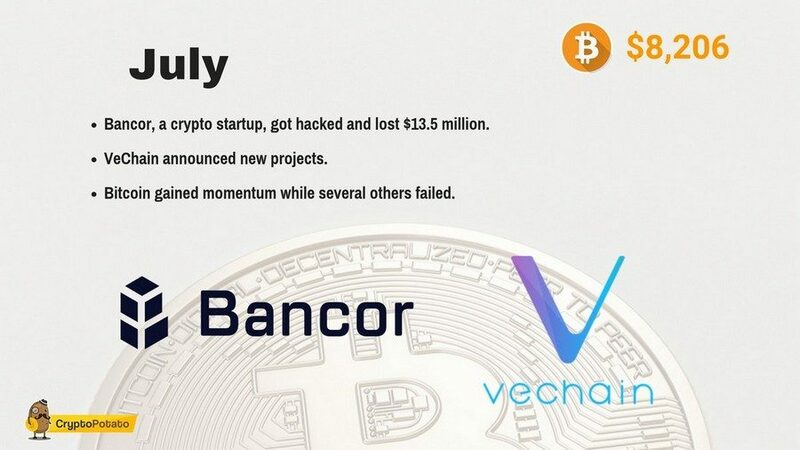 Bancor, a crypto startup, got hacked and lost $13.5 million. Bitcoin gained momentum while several others failed. Bitcoin was at $8206.83 by the end of July. August showed a negative trend in cryptocurrencies. In the first half of the month, the crypto market saw a drop of 20%. 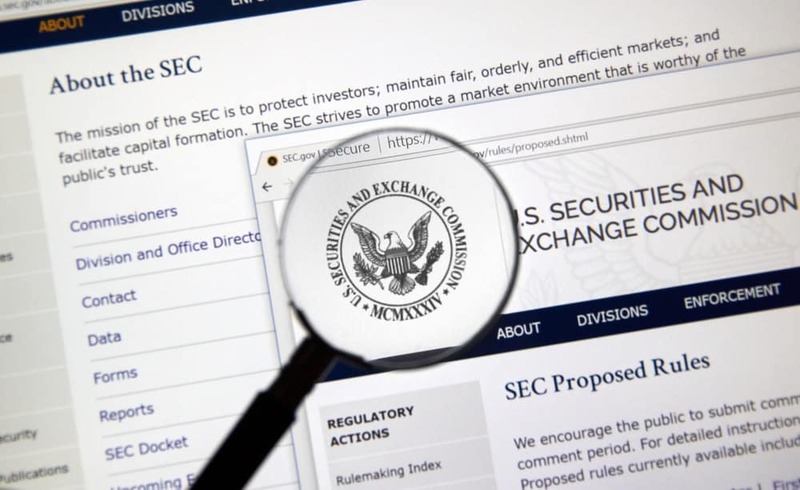 The decline could be the effect of SEC’s postponing its decision regarding Bitcoin exchange-traded funds. The decline was further fueled by the Chinese war on crypto. The Chinese government announced that they would shut down the trading platforms that are run by their residents. This created an adverse effect on the market, leading to further downfall in currency values. August also saw several prominent corporations joining hands for the launch of Bakkt, which was expected to become a significant solution for merchant-consumer collaboration in digital assets. 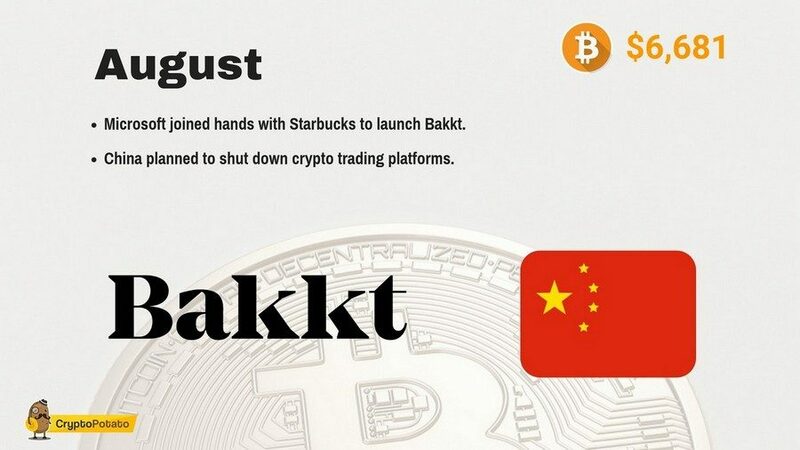 Microsoft joined hands with Starbucks to launch Bakkt. China planned to shut down crypto trading platforms. Bitcoin was at $6681.72 by the end of August. Time quickly transcended from August to September, but the misery continued. Things just got worse after August, and several coins saw new lows. September 12 gave another low point for several cryptocurrencies. The total market capitalization was $186 billion, which was about 77% lower than its all-time high. In the early days of September, the market lost about $40 billion in just one go. While things started to get better towards the end of the month, it was still the worst month of the year for the crypto market. Gemini Dollar, a new stablecoin, received regulatory approval. Several sectors of the federal government tested blockchain for their operations. 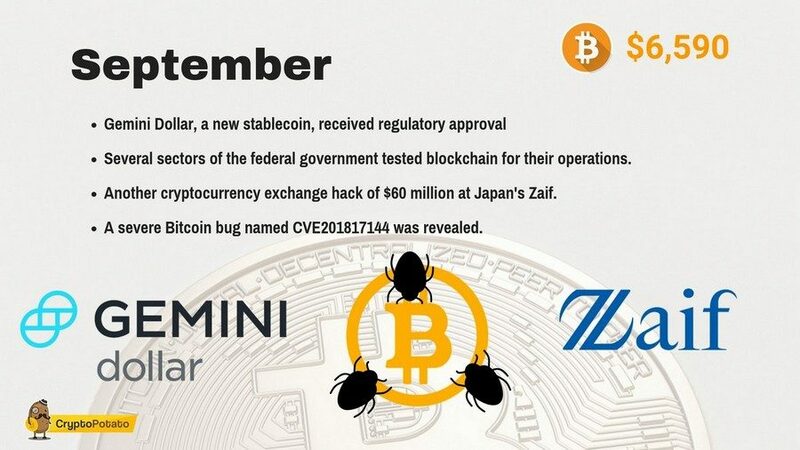 Another cryptocurrency exchange hack of $60 million at Japan’s Zaif. A severe Bitcoin bug named CVE201817144 was revealed. Bitcoin was at $6590.68 by the end of September. Crypto markets continue for fall for another month, and October shows no exception with a 9.4% decline in total market value. While the downward slope was not as steep as of September but the situation wasn’t positive either. Towards the end of the month, the market stood at about $200 billion, and the downward trend was pretty clear. Bitcoin, too, lost some ground in October as it started at $6,600 in the beginning but ended at $6,320. While there was a slight dip but for the most part, Bitcoin stayed stable in the range of $6k. Bitcoin was at $6477.32 by the end of October. November was another one of the continuous bad months for crypto. With a loss of over $70 billion, the market took a worse hit than what it did in September. A lot of altcoins took bad hits and fell lower than what many of us predicted. While Bitcoin sustained its value over $6k in October, it plummeted to about $3500 in November. Several other cryptocurrencies suffered a lot of pain by the end of the month. 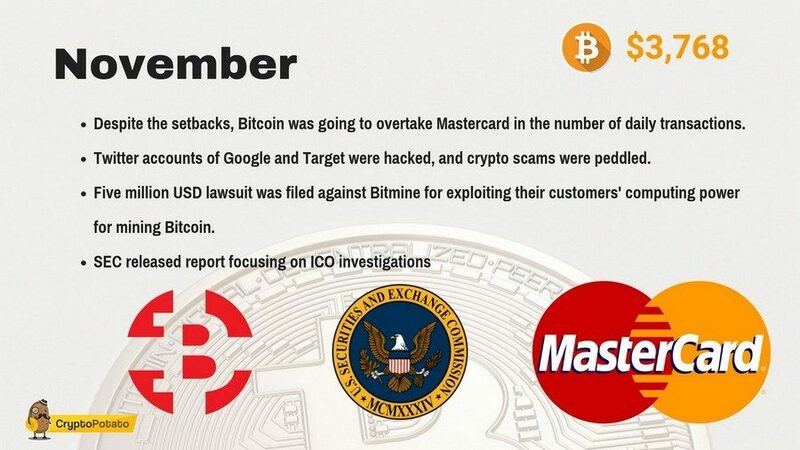 Despite the setbacks, Bitcoin was going to overtake Mastercard in the number of daily transactions. Twitter accounts of Google and Target were hacked, and crypto scams were peddled. Five million USD lawsuit was filed against Bitmine for exploiting their customers’ computing power for mining Bitcoin. Bitcoin was as low as $3768.79 by the end of November. The festive season brought some relaxation towards the end of the year. By now, Bitcoin had almost lost half its value since November beginning. It was mostly a bear market, but some bullish trends showed up on the chart. Bitcoin remained stable in December and didn’t lose much value. While the pessimistic mood is still prevalent, the slope isn’t as harmful as throughout the year. While the traders and miners were left hopeless towards the end of the year, there is still a lot of optimism that 2019 will bring a ray of new sunshine to the crypto world. 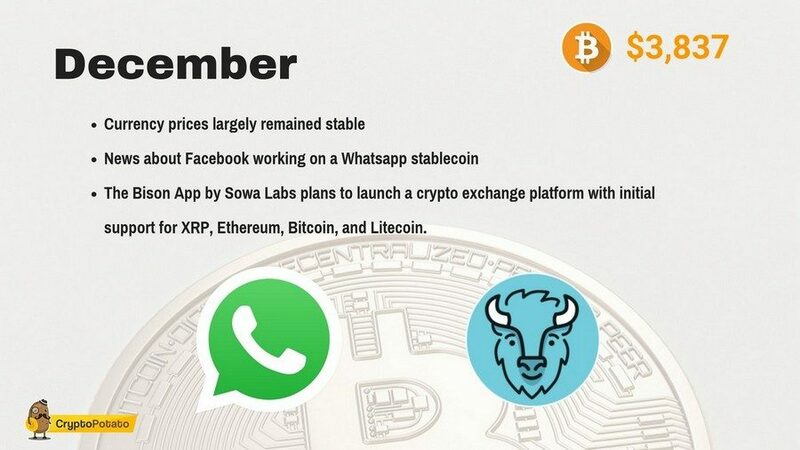 The Bison App by Sowa Labs plans to launch a crypto exchange platform with initial support for XRP, Ethereum, Bitcoin, and Litecoin. Bitcoin was at $3837.16 by the end of the year. Two thousand eighteen couldn’t be called a good year for cryptocurrencies. But the good news is that while the year started negatively, most currencies are doing well towards the end of December. Whether the charts show bulls or bears, one thing’s for sure – the crypto land never sees a dull day. The year left with a little sour taste though when Tax Authority launched an operation to locate digital coin holders. Nevertheless, many crypto enthusiasts have a positive attitude towards 2019 and hope that the New Year will take off some hurdles. 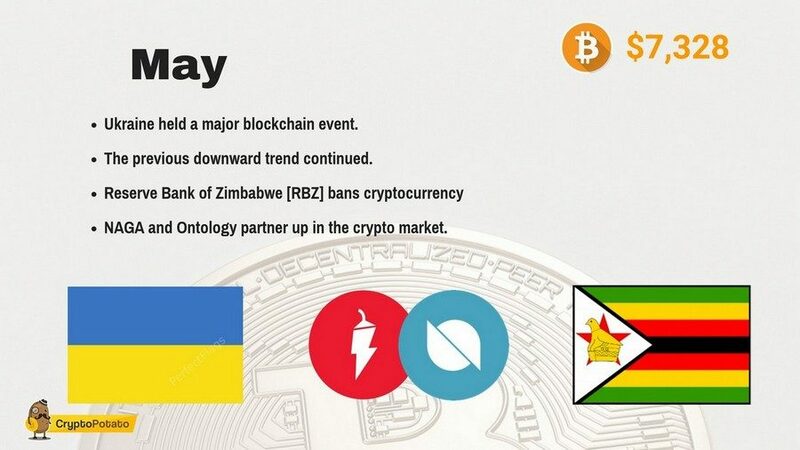 The post End Of The Year Bitcoin & Crypto Summary For 2018 appeared first on CryptoPotato.